ãIdeal to SOUNDPROOF ã– Recording Studios, vocal booths, home entertainment theaters and control rooms | Notification: The acoustic panels are FIREPROOF (They do not fuel a fire). They stop burning after the fire source fading. ã For professional acoustic control ã– Reduce waves, reverb and flutter echoes in smaller to medium sized rooms.Ceiling tiles, utility rooms, equipment enclosures, machine rooms Medical facilities, clean rooms, computer rooms, offices Gun ranges, engine compartments, compressor enclosures, manufacturing facilities. ãIMPORTANT NOTIFICATIONã– The product is coming compressed to reduce the shipping & overall cost. On that stage, the width per tile is about 1 inch. 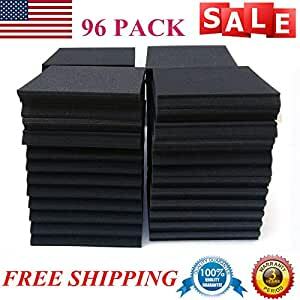 Please open the package and let them completely UNPACKED for at least 72 HOURS at room temperature to regain its original shape & size which is 12 X 12 X 2 inches. â Our products are shipped from US warehouses. â If you have any questions, please contact us. We will help you to solve it. â Our acoustic foam panels feature a classic âwedgeâ shape that reduces reverbs, sound waves, fluttering echoes, and residual sounds. but are also easy to shape and cut for other uses. -Suitable for sound recording studio, listening room, home theater, KTV, and all kinds of public places. and reflection of the increase in the number so as to achieve the noise, sound-absorbing effect. The physical size of this product will be inaccurate because the express package will be compressed. If you want to quickly restore the original size, you can soak it.